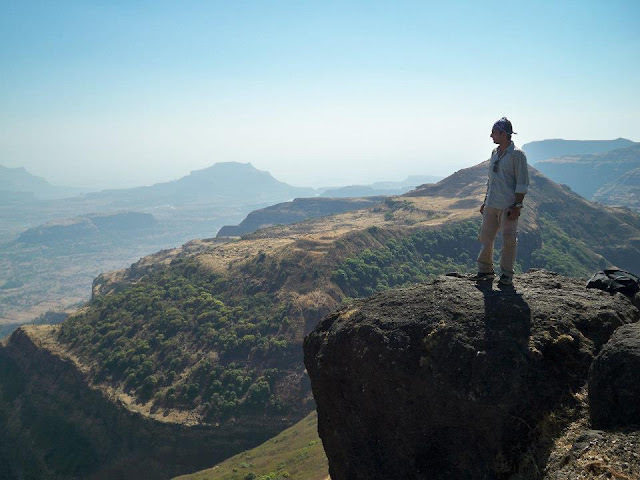 As a kid, I had a dream; dream of climbing Kalsubai – highest peak in Maharashtra. Finally this dream got realized on 17th Feb, 2013 with 46 people who never existed for me till this date. It all started with my vacation; I had taken vacation for 2 weeks (18th Feb 2013 to 1st Mar 2013) to relax; unwind; to find the real me. For me the real pleasure comes when I am with the nature and I wanted to kick start my vacation with a nice trek. 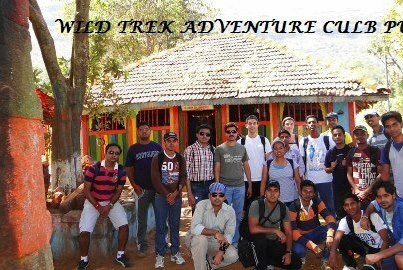 Since a long time, I wanted to do the trekking with a professional group and I searched on Trekdi site for a trek on 17th Feb. 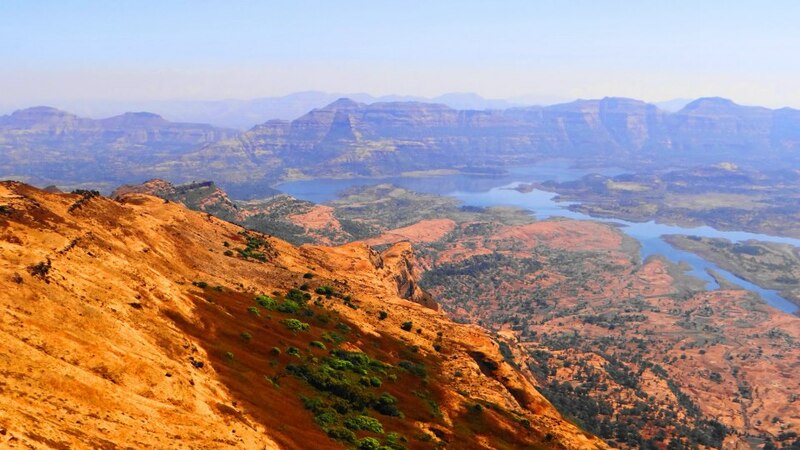 I found 1 day trek for Ghangad-Koraigad trek. I was so excited that I only looked at the date 17th and I did not check the month and did the online booking. After doing the booking, I forwarded their confirmation mail to my wife. Later, I got the call from my wife saying that I have booked the trek for 17th Mar and not on 17th Feb. 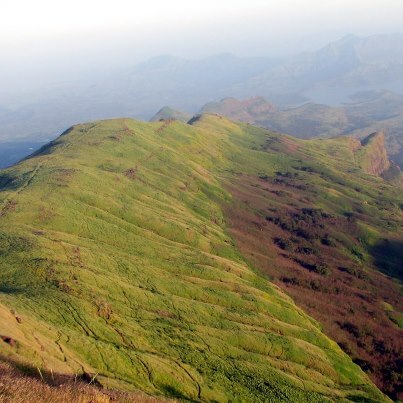 I was disappointed a bit and started searching for one day trek on 17th Feb and I finally saw an Kalsubai Trek invitation on Mumbai Hikers site with 3 different contact numbers. I dialed first number and it was switched off. Then I dialed the second number and Sandip one of the organizers of this trek picked up the phone. 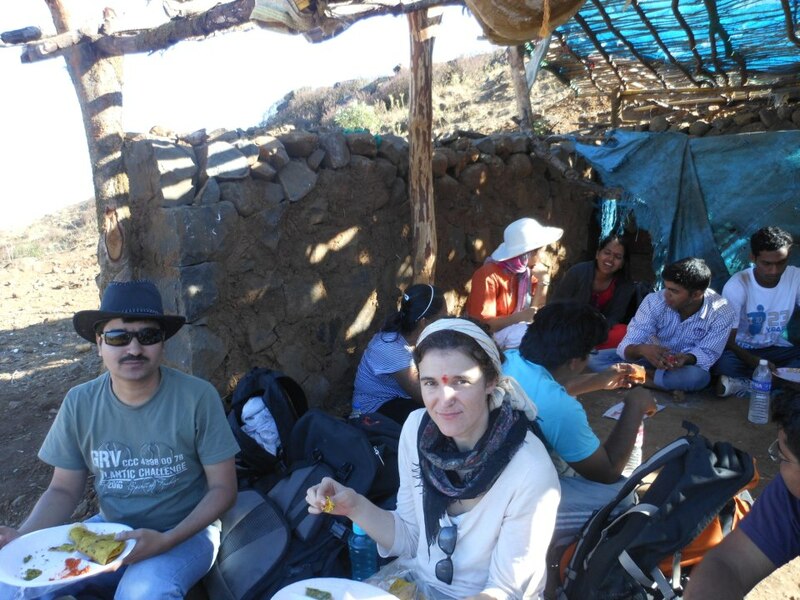 I introduced myself and enquired whether I could join their group for Kalsubai trek. Last date of registration was 12th Feb and I was calling on 13th Feb. Luckily, he told me that few seats were still vacant and I could join them. He never asked me to pay online and when I enquired he told me that it was ok if I paid later on the day of trek. I got a very nice feeling about this person on the phone and I made my mind to join this group. I got a final call on Saturday afternoon by Sandip for confirmation and I was asked to wait at Shivajinagar at 5.30 AM. I still had to do a packing and I did it in evening. My trekking sack was filled with 3 lit of water, dry-fruits, apple, sony mp3 player with headphone, napkin and few snacks. Boy, I was so excited that I did not rely on my wife to pack the bag and I did it on my own. Considering I had to get up early, I had a dinner around 8.15 PM and went to sleep around 9.30PM setting the alarm clock to 4 AM. Alarm clock as expected started ringing at 4AM and I got up instantly. I had a nice warm bath and was ready to leave sharp at 5AM. My wife and son both waved goodbye to me and I was off to Shivajinagar on my wife’s scooty. I reached Shivajinagar at 5.15AM, parked the vehicle at parking near Shivajinagar railway station and walked till Sancheti bridge and was waiting for the bus. Bus arrived at 5.45AM and my journey to Kalusubai with a group of unknown people who shared the same passion started. Our next stop was at Dapodi where 2 people were supposed to join us. 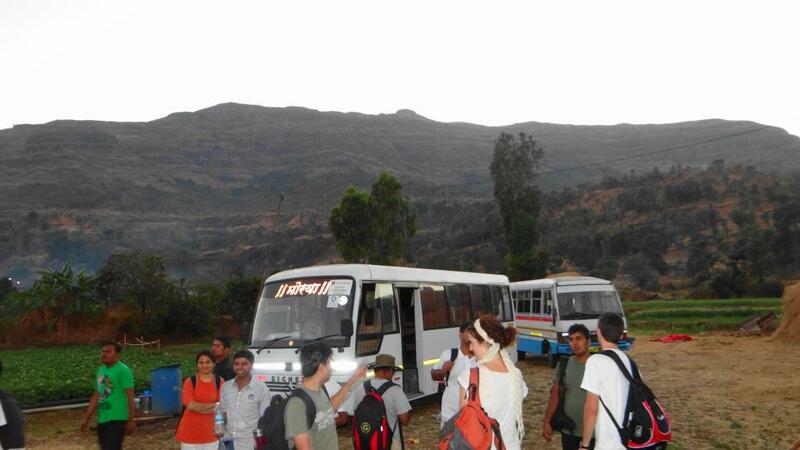 They were late by 10 min and I got down the bus and started conversing with the trekking members. I introduced myself to few of the members. The members with whom I was talking to were very young around 25. Also, I was amazed to see few of the young girls in the group as well. After picking up 2 members from Dapodi, we headed towards our next destination, Alefata. We reached there around 8.30 AM and had a breaksast of Poha and Tea on nearby stall. Now, here again 1 member was supposed to join us and he was 30 min late. I again started conversing with group and tried to understand the core group. By the way, I was under the impression was that I am trekking with Mumbai Hikers group but later I was told that this is “Wild Trek Adventures” group and they had used Mumbai Hikers website for advertisement since they do not have dedicated site of their own as of now. This was the classic case of not doing my homework properly! Finally, our Alefata member joined us who looked like an elderly man around 55. We had a nice photo session with Wild Trek Adventures placard at the background and left Alefata. 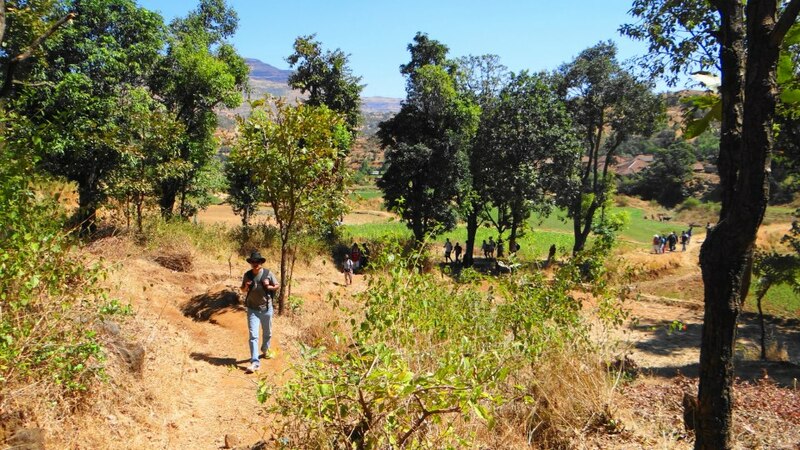 We went via Kotul, Tal: Akole and reached at Bari village (base village of Kalsubai) around 12 PM. We again had a round of photo session with Wild Trek and Kalsubai Village board at the background. Then we had a round of introduction for each member. We were total 47 people (26 from Pune and 21 from Mumbai). 2 spanish people were also part of Mumbai group. We were provided pack of Methi Parthas for lunch at the top. After few instructions from our group leader “Prasad Wagh”, we started trek. We were told that it would take around 3 hrs to reach at top. We started the trek around 12.15PM in the scorching heat. Fortunately, I had my cowboy hat and goggle with me to reduce the impact of the heat. After climbing around 15 min, we had our first stop at the big kalsubai temple. 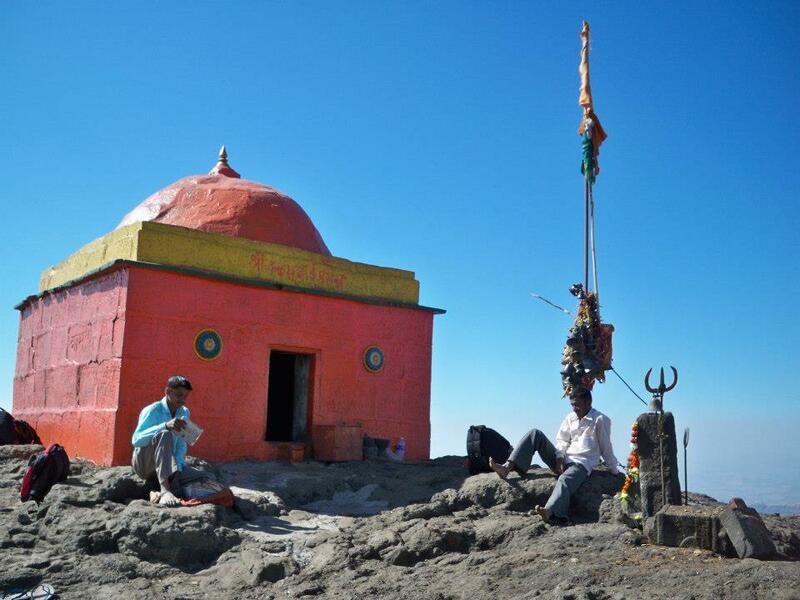 This temple is built for the people who cannot make it to the top to take blessing of the original temple of kalsubai. So they take the blessing from this temple and return. The temple was in shade and there was a temptation of taking a nap in the cool breeze. But we had our eyes set on the top target and there was no room for any temptation. Gradually and steadily we kept on climbing in the heat. Fortunately, there was a cool breeze and patches of shades where we could rest a bit. We were carrying a lot of water and energy bars which were helping us to beat the dehydration. There were little stalls of Lemon Juice and Butter Milk at a regular distance. I had had a glass of buttermilk at one stall and it felt like a heaven. After climbing for more than an hour, we came across first iron ladder. In my earlier treks, I had never come across such ladders. 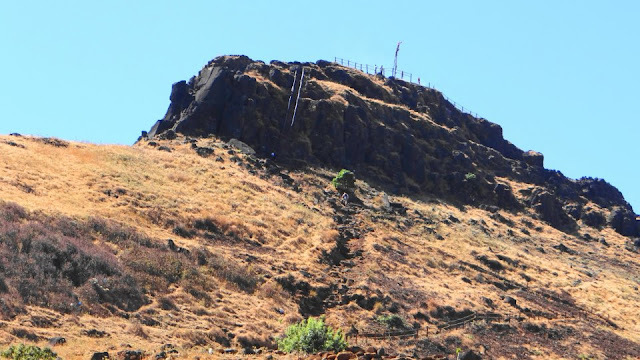 Though few days ago, I had read one blog regarding the “Shidi Ghat” to reach Bhimashankar where blogger had mentioned the different ladders to reach to Bhimashankar. 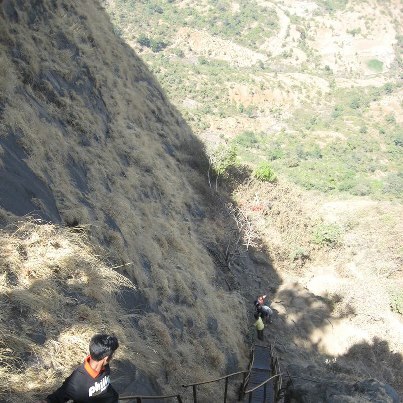 Ladders have made this trek easier as you don’t need special skills to negotiate some of the rocky patches. Well, without ladders, this trek would have been more difficult. I came across few elderly people more than 50 yrs, who were coming down from the ladders and they said to me that there are quite a few more ladders up and I would definitely enjoy them. A small girl of 6-7 years from the base village was also accompanying us and believe me, she was climbing it for the 2nd time in the same day. She was helping her family who had a Lemon Juice and Buttermilk stall near the top. Unbelievable! After trekking for more than 2.30 hrs, we came across a well full of cold water within the striking distance of peak. We had a rest of around 5 min and washed our faces with the cold water. It was a sublime experience. We were almost there now and pinnacle was within the striking distance. 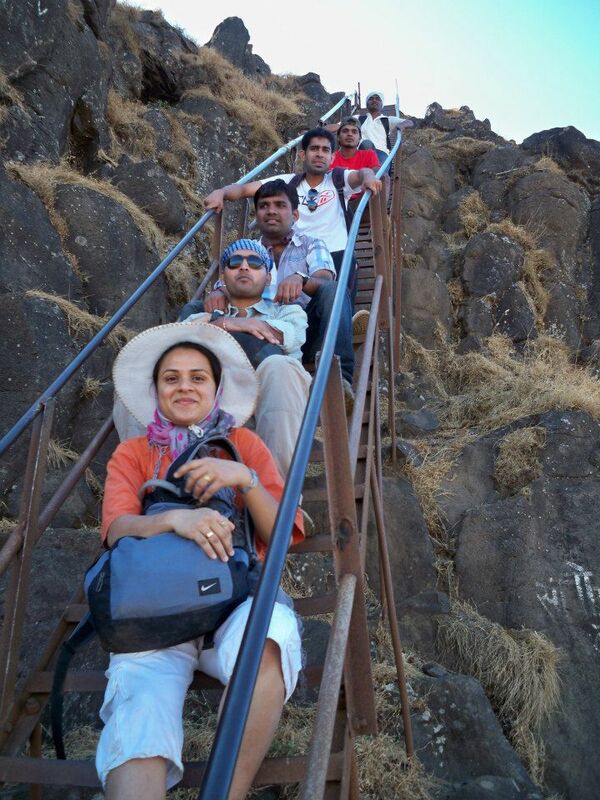 By this time, our first group was already on the top and I was with 3 UDCT guys who had joined us from Mumbai. We then proceeded towards the peak. Here we had to climb the final iron ladder to reach on top. Out of my other fellow members, 2 became more adventurous and they avoided ladder and preferred the rock patch next to ladder to climb to the summit. 1 guy seemed like a seasoned pro and climbed the patch easily. While the other guy, who tried to imitate him, was stuck in between where he was really scared and confused how to climb up. There was no option of him going down since it was more difficult. I was on the ladder where I could see all the steps he needs to take to overcome the rocky patch. As he was scared, I motivated him and guided him to reach on the top and the other guy pulled him up when he reached closer. For him, this was a close shave and we laughed heartily when he finally came on the top. Being the family man, I avoided this patch and chose the safest approach. Well, finally we were on top. Topmost point of Maharashtra! 5400 Ft above M.S.L. We were exhausted but when we looked around, all the tiredness went away in a flash. I just can’t describe the view from the top. It was just mesmerizing. On the west side, there were beautiful peaks of Alang, Madan, Kulang. On the east side, there is Bittangad, Patta fort and Aundha. 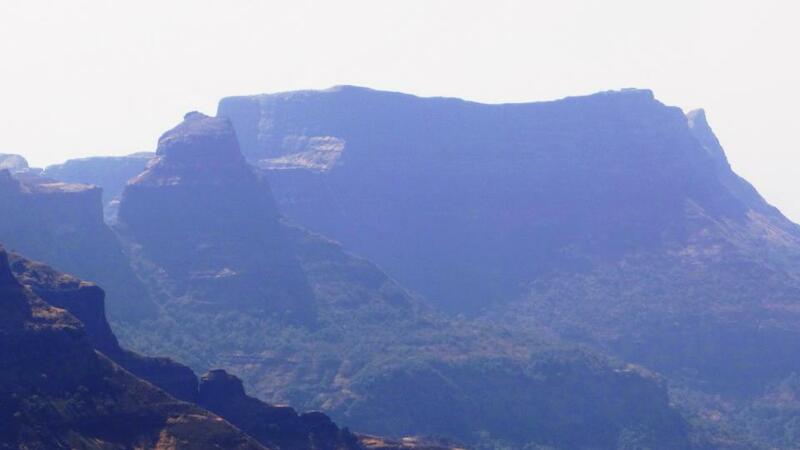 On the south side, you can see Harishchandra Gad, Ratan Gad, Ajoba, Kumabai’s Khind. I was swept away with the beauty of these peaks. I sat on a rock for a while and I was just looking and marveling at these beautiful peaks. As this was almost beginning of the summer, there was no disturbance of fog and clouds and the view was crystal clear. View of vast backwaters of Bhandardara Dam was quite enchanting. I was really humbled by the vastness and beauty of the nature. You feel very miniscule when you have a look at these gigantic mountains. After a while, I went inside the tiny temple of Kalsubai and sat quietly for 5-10 inside it with eyes closed. It was quite an heavenly experience. 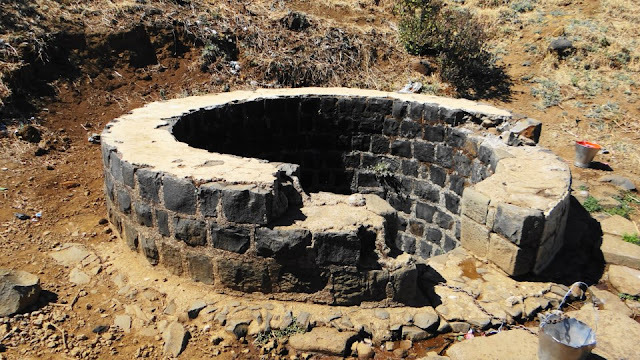 There is a tale of Kalsubai which is passed from generation to generation. There was a poor girl named Kalsu who loved wandering in the forests. 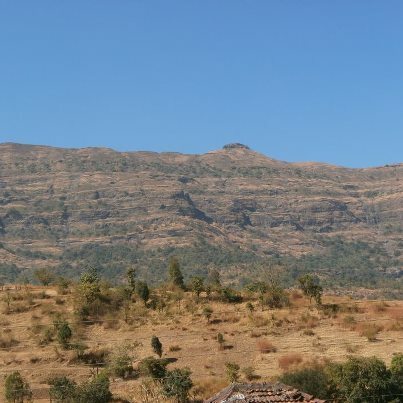 Once while wandering, she reached at Indur village at Kalsubai’s foothills towards the west. A family gave her a job there but she kept a condition that she will not clear the litter. After some time passed, she was told to clean some household mess and according to the command, she did so. She left the job, climbed to the peak and stayed there for the rest of her life. The people then started believing her as their goddess and built a small temple at the top. Our last group came almost after half an hour. There were some seasoned trekkers from our group who intentionally came late by having a lot of fun while ascending. When ladders were not installed, you needed to climb using the chain which was suspended from the top. This chain still exists and 3-4 members of our group used this chain to climb up. One member came up, came down and again came up using the chain. Amazing display of mountaineering skills! I preferred watching it from the top and did not try to attempt it this time. But definitely, I will try it once I have some more experience. 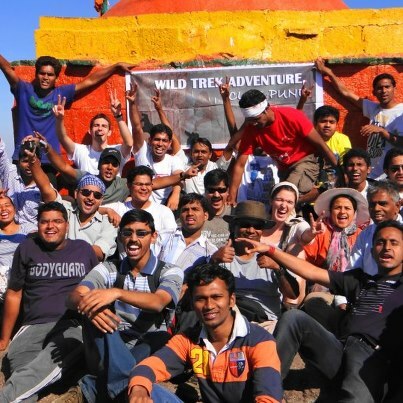 Once we had all the members on the top, we had a group photo at the back of Kalsubai temple. We were all hungry but still everybody was just roaming around soaking in the beauty of the nature. Finally, around 4PM, we climbed down and had our lunch under the shade near the well. In the lunch, we had Methi Parathas with Chutney and Thecha and this lunch tasted better than any other food. After finishing the lunch, we started descending. Well, descending was easy as compared to climbing. Also, the whole area was under the shade as sun had gone to other side. Some of the members whose shoes were not proper, slipped quite a few times. I also slipped once or twice but without any damage. Overall, it was an uneventful descent. Only thing is that you need to be careful while climbing down the ladders. While descending down, I came across 2 local villagers which were selling Lemon Juice at the top. I asked them how much they earn and they said that 200 to 400 Rs on the busy day. Well, if you see the problems and challenges of these villagers, your problems will automatically appear small. I asked Spanish members how the view looks from the top and whether they have similar mountains in Spain and they said that you can get the same exotic view from Spain mountains as well. First person to climb down was Prasad; he climbed down in whooping 35 min. Amazing guy with amazing skills! It took me around 1.30 hours to climb down and last person clocked 2.30 hrs to climb down. It takes a lot of toll on your knees while climbing down. Especially problem aggravates if you are over-weight. Well, finally we were all down by 6.45PM. There was sense of an achievement on everybody’s face. Personally, I was over the moon; so satisfied with my decision to trek with an unknown group. Finally, it was time to say adieu to Mumbai group. We then proceeded to Pune talking about the experience and sweet memories. We reached Shivajinagar, Pune around 12.45AM.. On the way back home on my 2 wheeler, I was stopped by few policemen who asked me what I was doing so late at night. I told them that I just came from trek to Kalsubai and they looked at me in amazement and let me go without further probe. Finally I reached home around 1.15AM. I washed my face, hands and feet with hot water and went to sleep around 1.30 AM. Well, I was awake for almost 22 hours at stretch and desperately needed a good night sleep. Overall, this trek was definitely the best and most challenging trek of my life. I would like to repeat this trek just after the monsoon when there will be a lot of greenery. This trek has made me more passionate about pursuing trekking hobby further and I am sure I will have more stories to share in future. Carry enough water. 3 Lit of water will be sufficient. 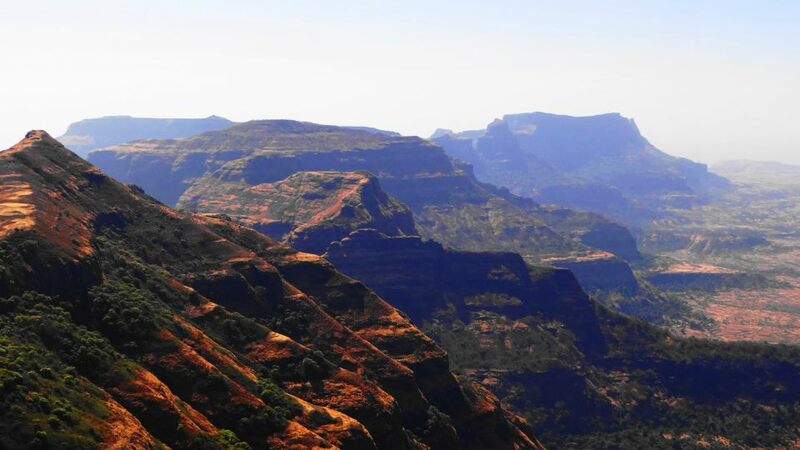 Winter is the recommended season to visit Kalsubai. Summer is also fine in case you have the stamina and like the rugged look of the terrain. Wear proper trekking shoes to avoid slipping. Do some small/medium size treks before you attempt this one. Regular walking/jogging routine will make this trek easier for you. Great .. and awesome ..
Wow... Sounds very exciting... Looks like you really pushed you limits... Keep it up :) and all the best for your next adventure !!! Nice one Prashant! It was like visiting Kalsubai with your group. Keep going places, and keep writing. - deepali. Trust this mail finds you in good health. 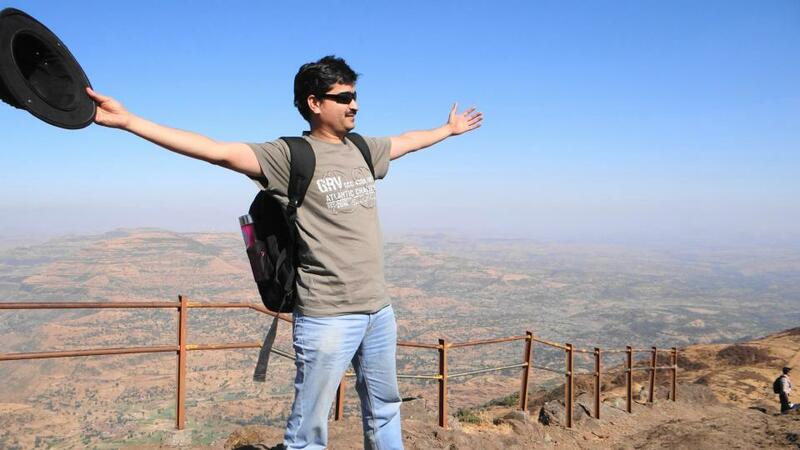 This is Subhrajit, co-founder of adventureclicknblog.com, a website focused on adventure travel. We started this website around 3-4 months ago. Our sole focus is on getting contributions from adventure travelers. We have also launched a credit system for contributions by which contributors can reimburse the points for cool travel stuffs or CASH as well (adventureclicknblog.com/moreblognearn.php). The credit points are a way of saying thank you for your sincere effort and time for writing. It would be great if you can send us your contributions to us. It can be done in 2 ways. You create your login and start contributing which can be edited by you anytime you want. The second option is you send us the link and our team will build your profile and send it to you. It gets published only after YOU APPROVE it. 1. Blogs & Trips - If you already have a blog, you can send / submit the link in our website as well. We will convert it into your contributions. You can edit it anytime you want. 2. Photos & Videos – You can send us the link of your photo albums of Facebook, Picassa, Google+ or Flickr. We will convert it into your contributions. You can edit it anytime you want. Feel free to send us suggestions on how should we improve it. It would also be really helpful, if you can connect us with fellow adventure travelers. Prashant, you people are amazing... 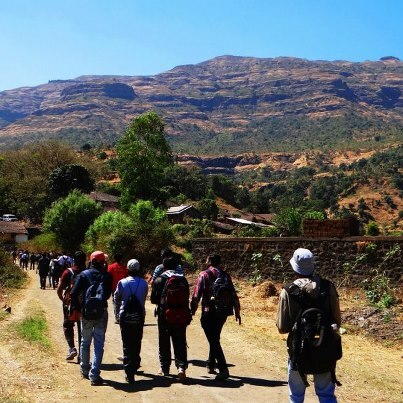 This must be a Fantastic experience as even I've had heard and learnt about KALSUBAI PEAK in history and geography in school days. Your work has revive that thirst of mine to know more about it. Good luck for your future and keep writing. thank you very much for sharing..its very useful to me. I'll definitely share my experience as well .